These cute hearts are an easy print. 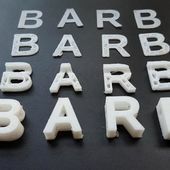 Use in cupcakes, leave around the house in surprise places or parade in your favorite Benchy. They are printed upside down so the front will be nice and smooth and easy to read. Use multiple colors like candy hearts. Even though these are not printed in NinjaFlex I'd like to let you know I sell small starter spools on my website 3dprintny.com for 9.99 , Amazon Prime (12.99) and eBay should you like to try out a flexible filament. I would use the best resolution your printer will allow and print in PLA. Be careful when you peel the picks off your build platform, best to let them cool a bit so the plastic doesn't bend.